healthytrading: Property Sector Play Hots Up! Property Sector Play Hots Up! As it seems, property stocks are on the rise given the highly volatile market conditions that have ensued on Wednesday's trading. They have been quite lagging in the blue chip rally last month given the impact of the stamp duties that really brought their prices way down in December. But things seem to be getting rosy for the counters and I have compiled snapshots of Capitaland, Keppeland, Ho Bee, Yanlord and Wing Tai. Bullish. Capitaland has just broken out of a minor resistance line (of a peak in mid July '11) and is steadily on an uptrend towards 3.25 of a fib projection 100% level. 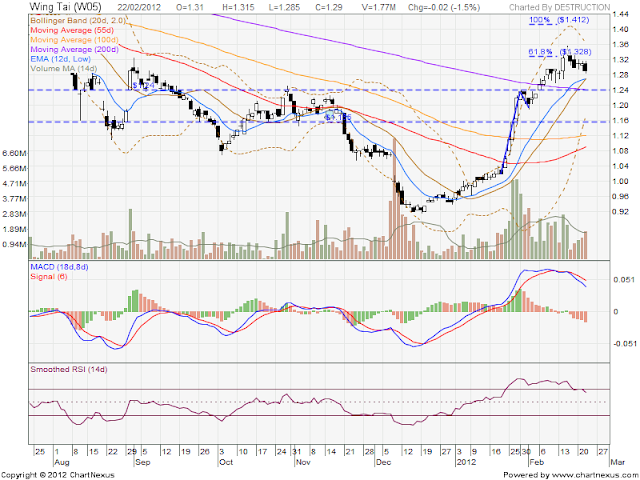 MACD histogram has been 3 days in green and positive. 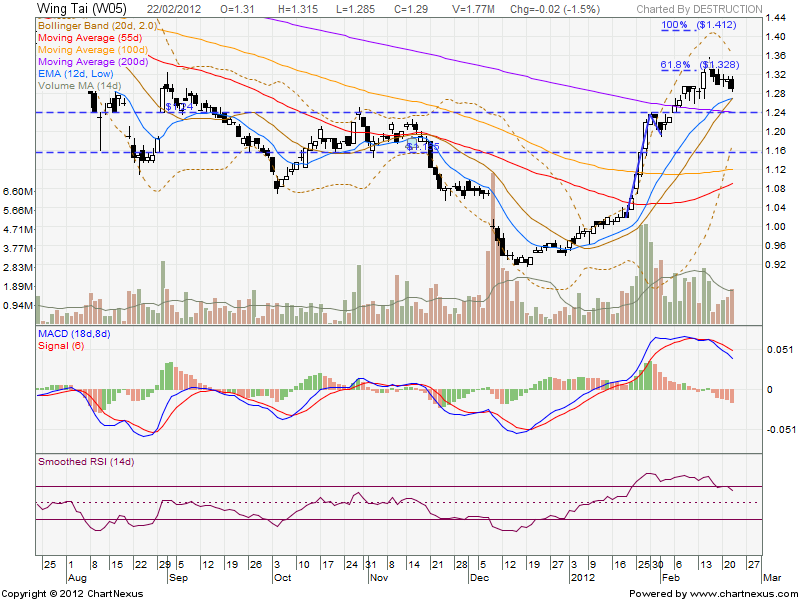 MACD line is trending up. Bullish with caution. Keppeland price has been trending very rapidly towards $3.43ish, facing its first test of confidence in a period of a year. 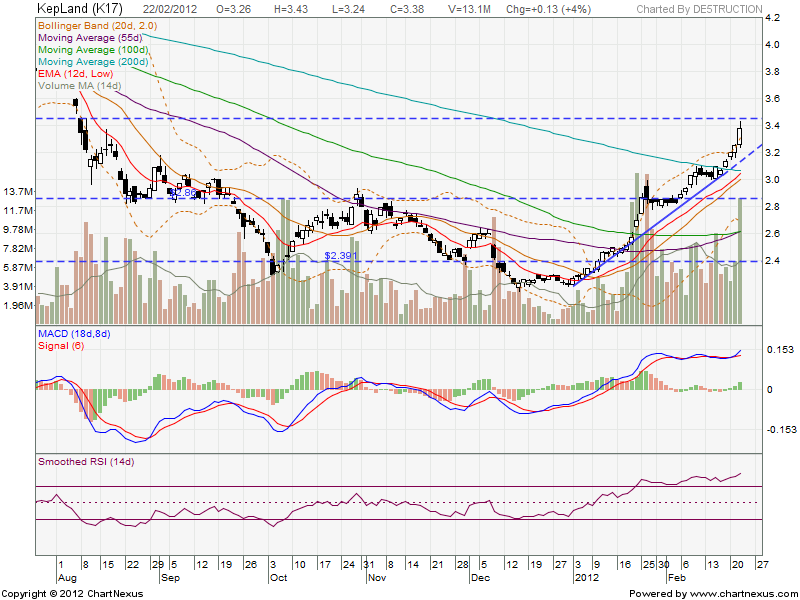 Expect some resistance from that resistance line and if it breaks, more upside is expected. For now, it does not seem like a true buy call yet. MACD histogram has been 4 days in green and positive. 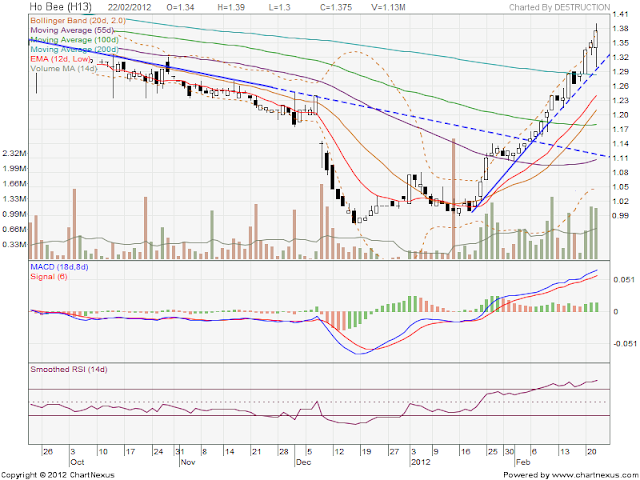 MACD line is trending up. Bullish. Ho Bee has been trending upwards significantly since mid Jan and prices have recently crossed the 200d MA line. Very well supported trend on the diagonal major support so looking very healthy as a clear trend trade. Volumes have been increasing but not too significantly. Bullish with caution. Yanlord has been trending upwards steadily since start Jan and prices have recently broke through a resistance line formed one plus year ago. Very clear uptrend but headwinds lie ahead from a $1.50 resistance line from a year ago as well as being supported by a fib projection of 100%. Bearish. Wing Tai is seeing a crossover between the 12d EMA and the 20d SMA lines as well as a trend reversal seen after hitting a peak resistance at $1.33. MACD histogram has been 5 days in red and negative. MACD line is trending down. 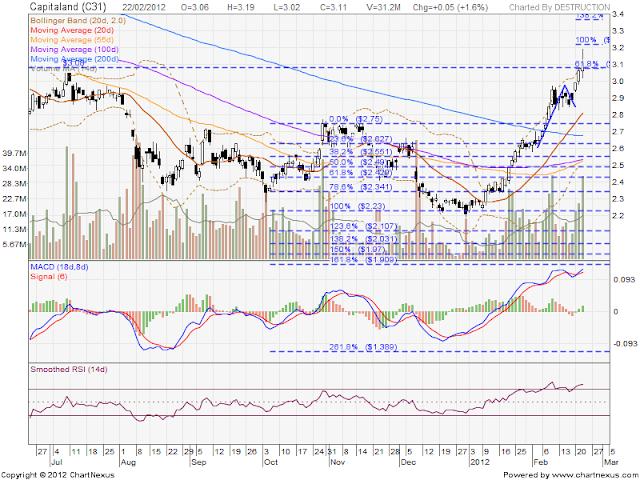 RSI just reentered the 'safety' zone which is also an indication for many traders as a short call. 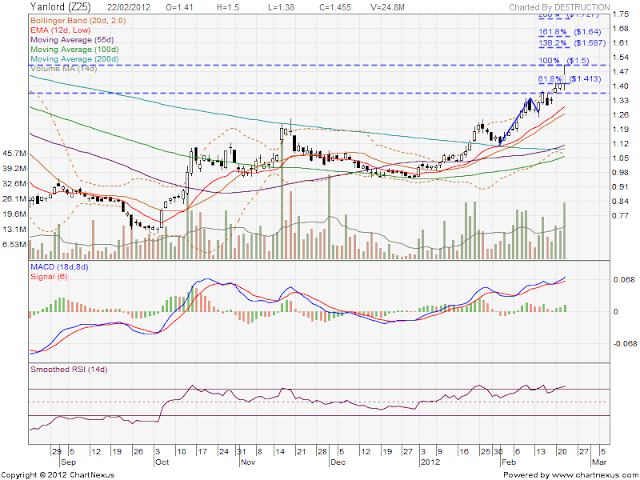 Volume on Wednesday has increased to match the bearish candlestick suggesting real price moving down.